Apple has targeted both a Chinese government agency and a Shanghai-based company in a new patent lawsuit related to the ownership of Siri, the voice-driven personal assistant found on iPhone and iPad. China's State Intellectual Property Office has been slapped with a patent lawsuit from Apple after the government agency failed to invalidate a patent from a Chinese company, according to Xinhua. 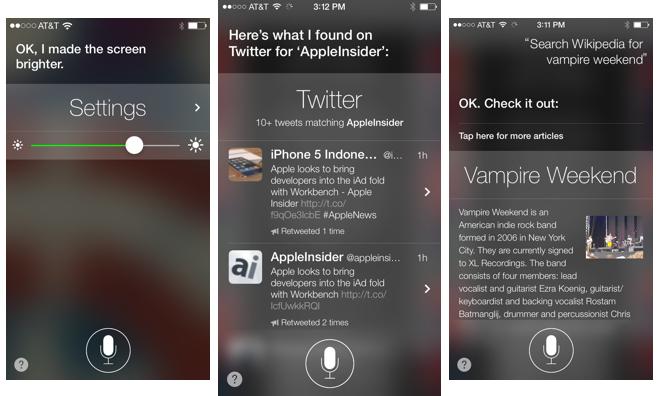 At issue is Shanghai's Zhizhen Network Technology, which has developed software similar to Apple's own Siri. Apple previously asked the government agency to invalidate a voice recognition patent owned by Zhizhen, but the intellectual property office declined to do so. The Intermediate People's Court will reportedly hear the case brought forward by Apple on Thursday. The dispute between Apple and Zhizhen has been ongoing for some time. Apple was sued by Zhizhen last year, in a complaint that accused Siri of being copied from its own "Xiao i Robot" software patented in 2004. A hearing on that complaint was reportedly held last July, but no ruling was handed down. AFP reached out to Apple seeking a comment regarding the newly filed complaints against Zhizhen and the Chinese government agency, but the Cupertino, Calif., company declined to respond. A separate, U.S.-based Siri-related lawsuit, which accused Apple of misleading in advertisements on the capabilities of the voice-driven software, was tossed out by a U.S. District Court judge earlier this month.